When people find out or realize that food is not only my hobby but also work – that I blog about food, shoot and style food and obviously cook with a lot of food – they are often curious about the kind of cuisine I cook at home. Probably expecting me to define myself to one specific cuisine – probably Indian. They are often fascinated when I tell them that I truly enjoy blending ingredients to give a variety of different flavors in combinations that come together often as an idea or experiment. It’s dishes like the dark chocolate and tahini clafoutis, the Brunost cheese panna cotta with sticky toffee pears, or the ossobucco with prunes apricots and saffron that keeps me moving in my kitchen. An interesting ingredient, a notion of a flavor, a memory of a meal and I am off with my idea. Influences for my ideas are – not surprisingly the Middle Eastern and Indian cuisines with a heavy pinch of Asian and often some Italian, German and Scandinavian thrown in for a stimulating mix. This dessert is the perfect example of simple yet intriguing ideas that are created and developed with an uncomplicated ingredient. In this case it was honey. I was asked to shoot a few shots for the wonderful Balqees Raw Honey to present their beautiful raw honey in scene with different dishes – sweet and savory. I’ve been having fun developing the recipes for this project almost a bit more than the actual task of styling and shooting. Green tea is mixed with raw honey, orange slices and infused with cinnamon, star anise and an extravagant pinch of saffron for color and that oriental flavor. In this liquid I have poached my lovely sweet Conference pears and to complete this as a delightful dessert I serve the pears on a smooth and creamy Skyr. Skyr is one of the products I totally fell in love with when I was in Norway and Denmark a few years ago. Skyr is a cultured dairy product that is thick and creamy and tangy like Greek yogurt and reminiscent of quark and it comes from the uncharted foodie country of Iceland. Imagine a rich, dense creamy yogurt-like product that is so thick you can almost slice it. How it can still have 0% milk fat is a mystery to me. Skyr, however is not yogurt but a fresh skim-milk cheese, strained to a whipped custard-like consistency and feels like velvety pudding in your mouth. As it is strained to such a density, it requires about three times more milk to produce than yogurt, which means it is higher in protein and calcium. That is where the current issues are beginning to arise as Skyr becomes more mainstream and is being called the next superfood, farmers in Iceland just are not able to keep up with the demand. With a population of dairy cows of only 25,000 animals, Icelandic farmers are particular not to force more milk production from the cows to keep the quality high. While the original Icelandic brand is unbeatable there are German and Danish brands, using local milk from local dairy farmers. I adore using Sykr for smoothies with berries, mangoes and other fruit, or simple add chunks of persimmon, nuts, honey and chia seeds for a tangy and delicious breakfast. For this dessert Skyr is the best partner keeping it a light and healthy dessert with only the honey to sweeten the pears. Drizzle the wonderful poaching liquid over the Skyr and spoon it together with chunks of the soft honey pears – bliss! Put the green tea, orange slices, cinnamon stick, star anise, honey and saffron in a large saucepan and heat over medium heat. 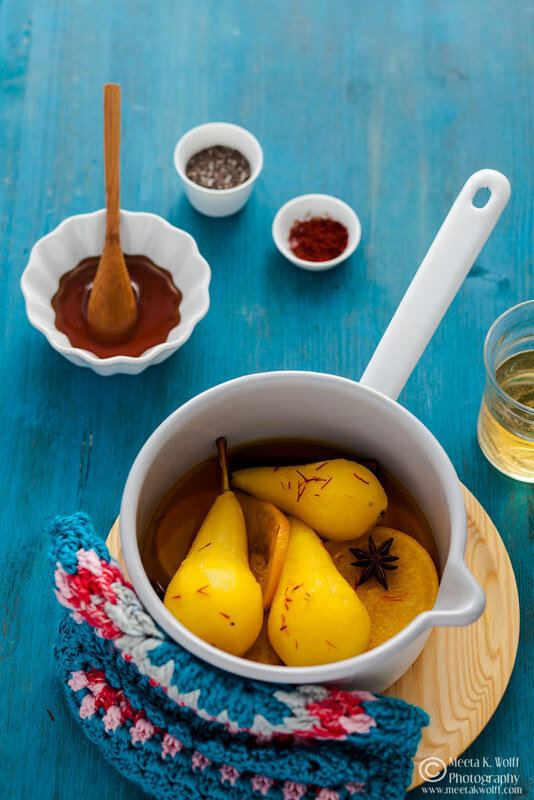 Once the liquid has started to boil, reduce the heat and place the peeled pears into the saucepan. 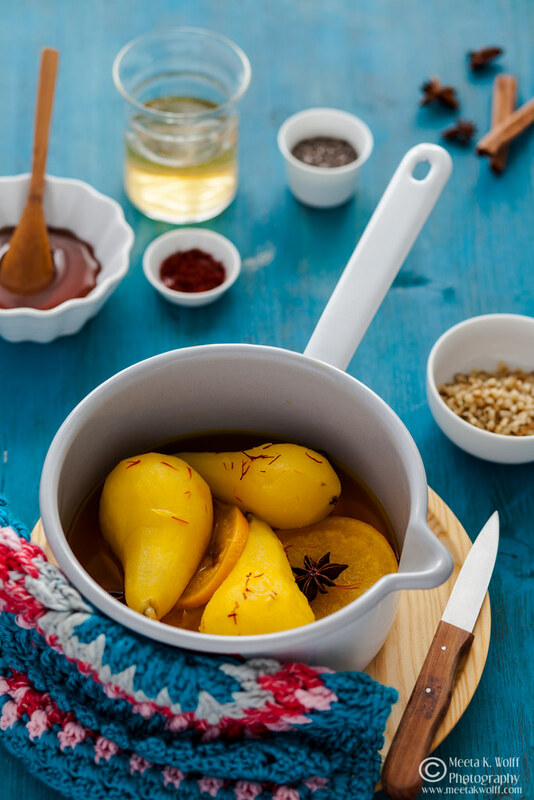 Depending on the size of your pears poach the fruit for 15 - 20 minutes, turning every so often so that the pears take on an even color from the saffron. 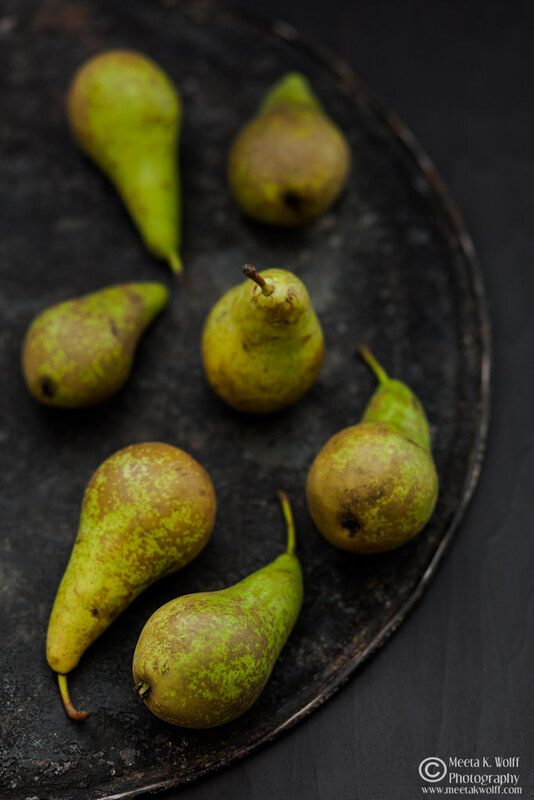 Once the pears have softened, remove from the heat and allow to cool and steep. Overnight steeping is recommended as the pears really take on a lovely flavor from the poaching liquid. 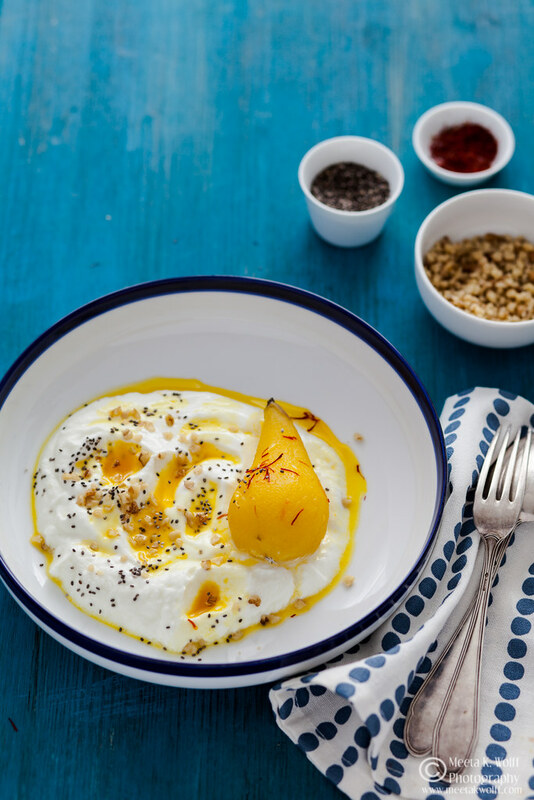 Divide the skyr into 4 bowls, scatter with walnuts and chia seeds then place a pear on top. 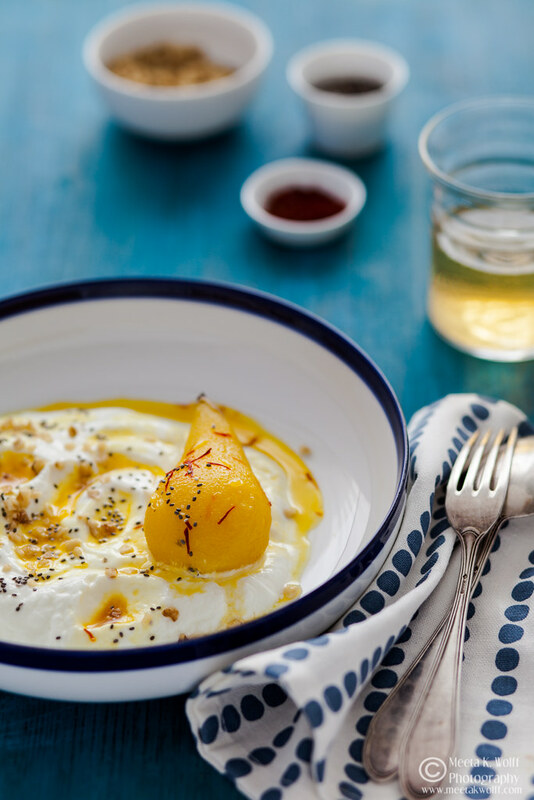 Drizzle a tablespoon or more of the poaching honey saffron liquid over the pear and the skyr. If you want to sweeten the skyr add a tablespoon of honey and mix before plating. Other spices work well with this dessert too. Try cardamom or cloves. Grated dark chocolate adds another gorgeous and decadent level to the dessert. There are a burst of flavors and textures that come together to give a magnificent, easy dessert. The pears can be prepared the night before, allowing for an intensive infusion and once the creamy, silky Skyr is spooned into the bowls, the gorgeous saffron and honey flavored liquid drizzled on the Skyr and the soft pear placed delicately over the top, sprinkled with a few crunchy walnuts and chia seeds - every single mouth will be watering. For us the honey in the poaching liquid is enough when it comes to sweetness but you are free to sweeten according to your own tastes. 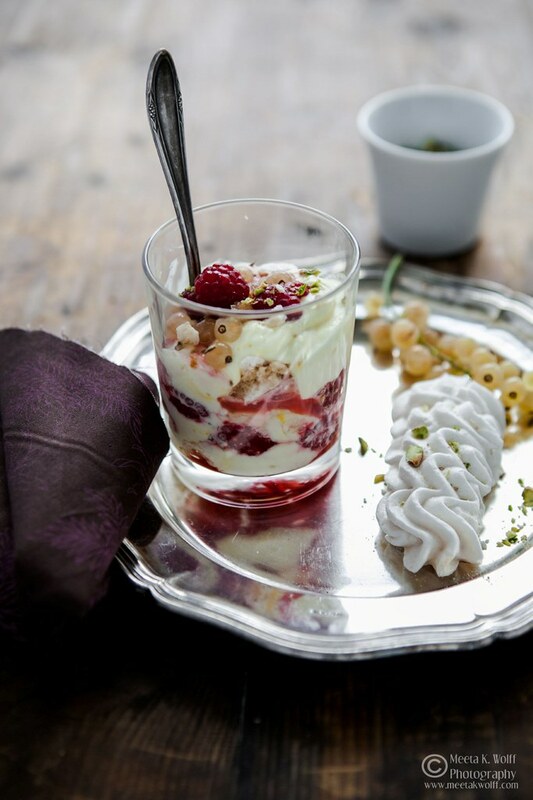 If you cannot find Skyr use drained quark, or labneh or even good old Greek yogurt. Last week I was away in Leipzig, a city I lived in for 3 years and the city where my son was born. I was working on a fun project with the German MDR TV on the topic of healthy indulgences. Together with a lovely fellow foodie Claudia Friedrich of Heldenküche we spent the day in Leipzig in a cooking studio cooking up some great healthy recipes, visiting the local market and talking about what indulgences mean to us. The short feature will be aired on 26 November and I hope to share the link with you here. Follow me on Instagram and join me as I share my adventures and daily shots with you. Thanks Dolphia! And yes very easy to make! Hi meeta, the picture of the pear had stuck to my brains and I had bookmarked it to read later. I loved your choice of ingredients. It must surely be amazing to be in the middle of fun. It's always awesome to be in the middle of fun so I enjoy it while it lasts. Glad you liked the recipe! Hello Meeta, I am fond of your recipe and your writing, I did tried this recipe, I am not sure I was able to cook it properly but it tasted good. I am sure it turned out well - it's a fairly easy recipe to follow and glad to hear it tasted good! Never came across Skyr before but it sounds good. Beautiful photos. As usual! Never heard of Skyr - eeek, am I still allowed to call myself a food blogger?! ;o) I also hate it when people ask me what cuisine I cook at home. It varies! Some nights yes, it is ready-meal curry from the supermarket... but other nights it is grilled fish or meat; other nights pasta; and some nights a stir fry. Why would anybody confine themselves to one cuisine? Love the colour of those saffron pears! Do you think I could use apricots instead of pears for this recipe?